Cranberry sage pork dumplings. Roasted miso maple potatoes. Ginger scallion lobster rolls. 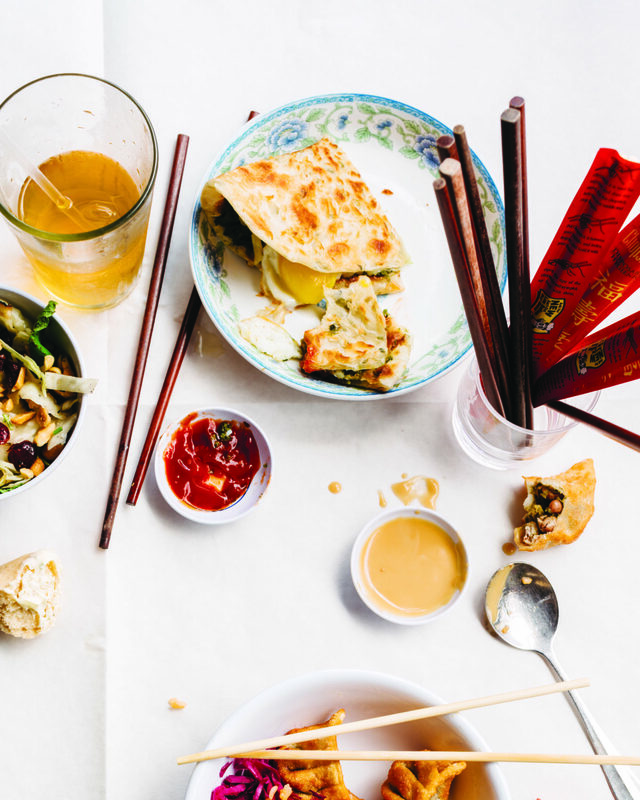 Those are just some of the dishes featured in a new cookbook released just this week called "Double Awesome Chinese Food: Irresistible and Totally Achievable Recipes From Our Chinese-American Kitchen." 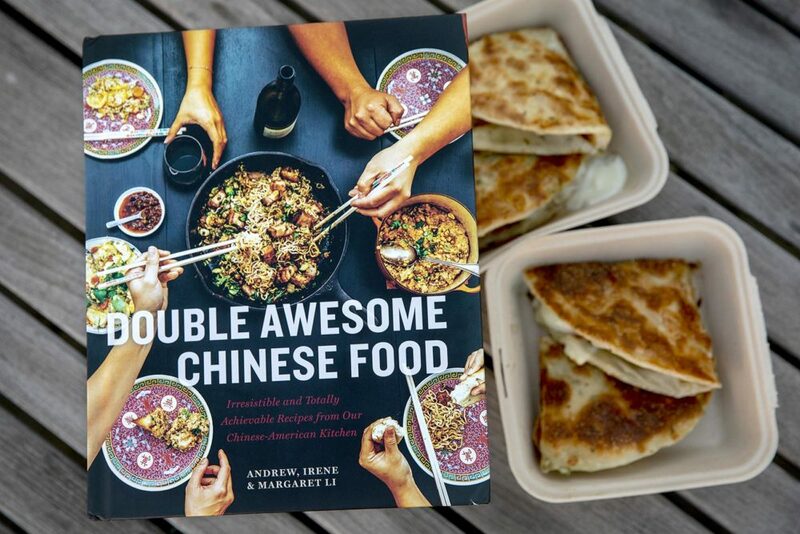 The authors are Margaret, Irene and Andrew Li — the sibling co-owners of the Mei Mei Group, a Boston-based restaurant, food truck and catering company. 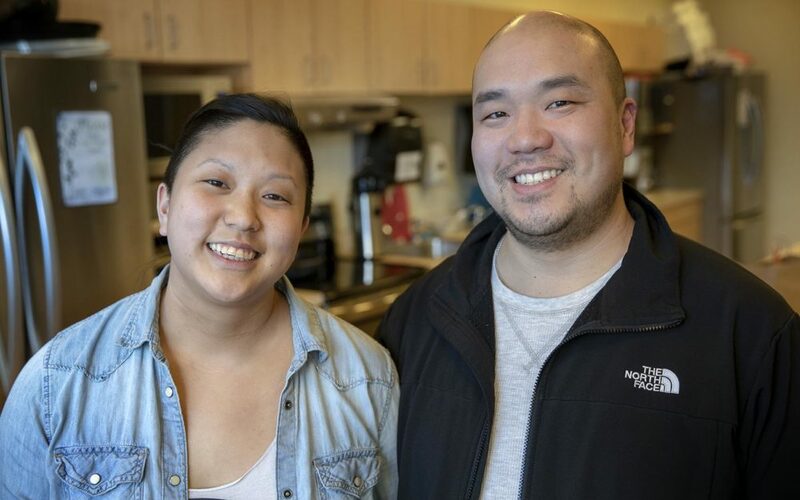 Irene and Andrew tell us what it's like for three siblings to run a business together, how they celebrate Chinese-American fusion, and how they came up with the "Double Awesome." Mei Mei's Double Awesome Sandwich (Michael Piazza; Reprinted in arrangement with Roost Books, an imprint of Shambhala Publications, Inc). Heat 1 tablespoon of the oil in a skillet large enough to comfortably fit a scallion pancake (ideally nonstick or cast-iron) over medium heat. Once the oil is shimmering, carefully place the pancake into the pan and cook until golden brown on the bottom, about 3 minutes. Using tongs, flip the pancake over to brown on the other side. Sprinkle ⅓ cup (40 g) of the cheese onto the pancake to melt while the bottom cooks. Once cooked on both sides, use tongs or a spatula to carefully place the pancake, cheese-side up, onto a heatproof plate or tray and place in the oven to stay warm while you cook the second pancake. Once both pancakes are in the oven, crack the eggs into the pan and lightly fry them, adding more oil if necessary to prevent sticking. To achieve a similar effect to the famous Mei Mei slow-poached-then-fried oozy egg scenario, fry the egg lightly on one side, then flip to lightly brown the other side. The eggs should be cooked and a bit crispy on the outside, and the yolk should still be runny. Remove a pancake from the oven and place it on a cutting board, cheese-side up. Smear 1 tablespoon of the pesto on half the pancake, then place the two eggs on the pesto side. Use a spatula to fold the pancake in half, covering both eggs, and cut between the eggs to form two pieces of awesome. Repeat with the second pancake. This isn’t a classic pesto—no nuts, no cheese—but it’s made from the same process that gives pesto its name (from the Italian verb pestare, meaning to pound or crush). It’s both convenient for people with allergies and easier and cheaper to make at home. Use whatever seasonal greens you get from the market or have at home, including greens that are slightly too wilted or yellowed for a salad. Feel free to make extra; large amounts can be frozen for later use. Combine the greens, oil, vinegar, and garlic in a blender and blend until you have an easily spreadable paste. Depending on how tightly packed your greens are, you may need to drizzle in additional oil or vinegar. Season with salt and use immediately or store in an airtight container in the refrigerator for up to a week. If you’ve ever had these flaky fried discs dotted with slivers of green onions, you know they can be seriously addictive. When you have perfected the quick and easy scallion pancake recipe to the point that it only takes you an hour or less to make, it’s dangerous business. We give you this scallion pancake recipe with a warning: with great power comes great responsibility. After trying these pancakes, the mere sizzle of the pan or scent of freshly chopped scallions may cause you to relinquish control, churning out pancake after pancake and consuming every bite. Cook at your own risk . . .
Cut the dough into 4 equal pieces. Take one piece and cover the rest with a damp cloth. Roll the piece into a ball, flatten it slightly, then use a rolling pin to flatten it into a circle about 8 inches in diameter. Use a brush (or your fingers) to cover the dough circle with 1 tablespoon of the sesame oil, then sprinkle with ⅓ cup of the scallions. Roll up the circle into a snake then twist the snake into a snail-like spiral and tuck the end underneath. Flatten slightly with your hand, then use the rolling pin to roll out again into an 8-inch circle. Stop here, or, if you want more flaky layers, repeat the snake and snail steps and roll out again. Be gentle, as scallions may burst out of the dough as you continue. Repeat with the remaining dough to make four pancakes. Mix the flour and salt in a large bowl. Using a wooden spoon, slowly stir in ¾ cup (180 g) of the hot water until a ball is formed and all the flour is incorporated. If the flour in the bottom of the bowl is not sticking to the ball, slowly drizzle in more water 1 teaspoon at a time and continue to stir. Irene and Andrew Li, sibling co-owners of the Mei Mei Restaurant Group and Co-authors of "Double Awesome Chinese Food: Irresistible and Totally Achievable Recipes From Our Chinese American Kitchen." Irene is also the head chef of Mei Mei, a 2018 James Beard semifinalist, and a food columnist for WBUR's ARTery. She tweets @ireneshiangli.